Vimal Industrial System - a supplier of solutions for assembly automation - offers solution through basic concepts, design, manufacturing, implementation and support of automated systems. These solutions reduce operator fatigue, and enhance productivity and quality of products. 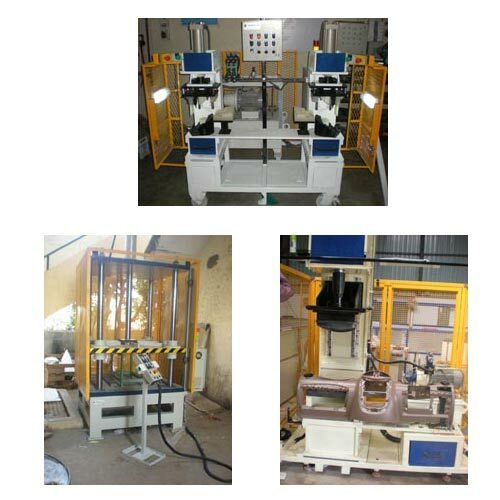 The range of products includes welding fixtures and welding automation for automobile industry; CNC machining fixtures, custom built special purpose machines (SPMs), mechanical assemblies for automation and robot industry, PLC controlled hydraulic fixtures, receiving gauges and inspection gauges. It also consists of hydraulics presses, end forming machine, rotary welding SPMs, assembly presses, endurance testing SPMs, conveyors, auto gauging systems, tack welding and full welding fixtures, etc. These products are used for manufacturing brakes, dash boards, vehicle doors, front and rear bumpers, vehicle mirrors, car body, exhaust systems, vehicle tanks (washer tank, radiator tank, fuel tank), batteries, hoses, logos, mirrors, steering, car interiors, furniture, lighting, etc.